Modular open stair suitable for small environments. This stairs designs combines advanced technology, practicality and sturdiness in kit packing to permit quick delivery. The rise adjustment is made by a steel spacer positioned between the two supports. The structure of the platform is completely modular, in order to allow the assembly of the components depending on the stairs sense of climb. 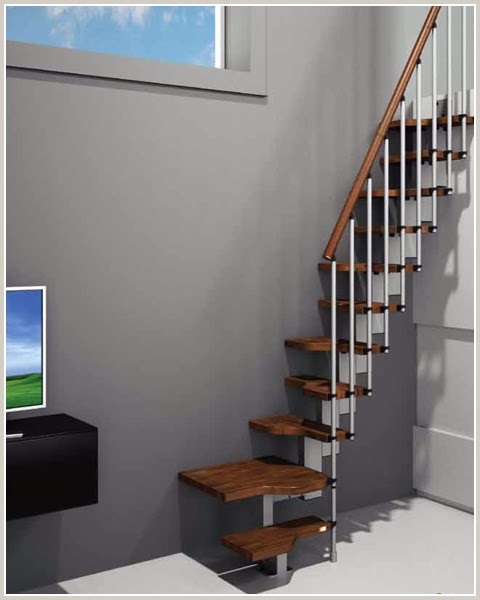 For additional stair rigidity there are some special lateral supports that fix the structure to the wall. Mini Plus closeup . Intermediate risers Min 7.8" Max 9.4" The first riser is fixed at 7.8" . The steps are manufactured in solid European beech wood with a thickness of 1.5" and beveled around the edges. The connection to the structure are made with bolts screwed to the steel plate of the supports. The railing system is made with steel tubing balusters diam. 0.86", fixed beside the step and to the handrail. The handrail is of solid beech wood. (diam . 2" in lengths of 39.37"). Color stains: Natural 12, Walnut 15, Walnut 16, Mahogany 18, Mahogany 20 Steel - embossed black.